GetUp takes Bank Australia commissions - Rite-ON! 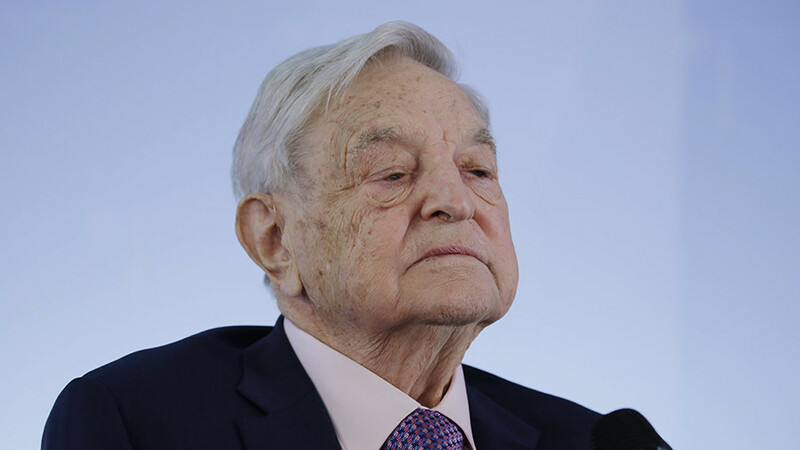 Left-wing activist hub GetUp is earning windfall commissions for supporters to switch to a ­little-known bank that kicks back a fee on savings accounts and every mortgage changed over. 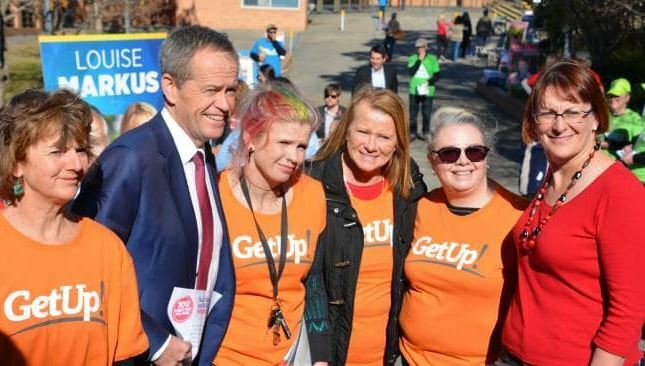 The deal between the high-minded pressure group and Bank Australia is a handy earner for GetUp at a time when it is going after the major banks for cheating customers and finan­cing “unethical and damaging” projects. Bank Australia, a mutual that is cashing in on the damage inflicted on its big-name rivals by Kenneth Hayne’s financial services royal commission, pays GetUp 0.4 per cent of the value of home loans and $50 on accounts with monthly deposits of more than $2000 transferred by its membership. The mortgage offer, detailed in a page on the GetUp website, would reap a commission of $1860 on an average-sized home loan in NSW worth $465,100. GetUp’s 2018 accounts show it earned $452,190 from such referrals in the past two years, on top of the reported $2 million pocketed from encouraging its claimed one million supporters to go with online energy retailer Powershop under another sweetheart deal. Defending the commission arrangement with Bank Australia, GetUp said yesterday it received on average $75 for each person who had shifted banks through the “pilot partnership”. “While we can’t give financial advice, we tell people that Bank Australia is an ethical alternative to the big banks … and are ­transparent we will receive a one-off donation if someone makes the switch,” a spokesman insisted. Gerard Benedet, national director of the Advance Australia group which presents as a conservative answer to GetUp, said the deal would “leave a sour taste in anyone’s mouth”. “The banking royal commission has taken aim at secret commissions paid to mortgage brokers. Now GetUp has been caught accepting commissions from Bank Australia,” he said. In gunning for the big four banks, GetUp claims Westpac, ANZ, NAB and Commonwealth Bank have “ripped off their customers, handed out shonky fin­ancial advice and poured billions into unethical and damaging ­fossil fuel projects”. It says more than 20,000 “of us” have pledged to take their business elsewhere, up from 7000 two years ago. “Now we are following through on the threat by walking away from them once and for all, and taking our money to banks that share our values. 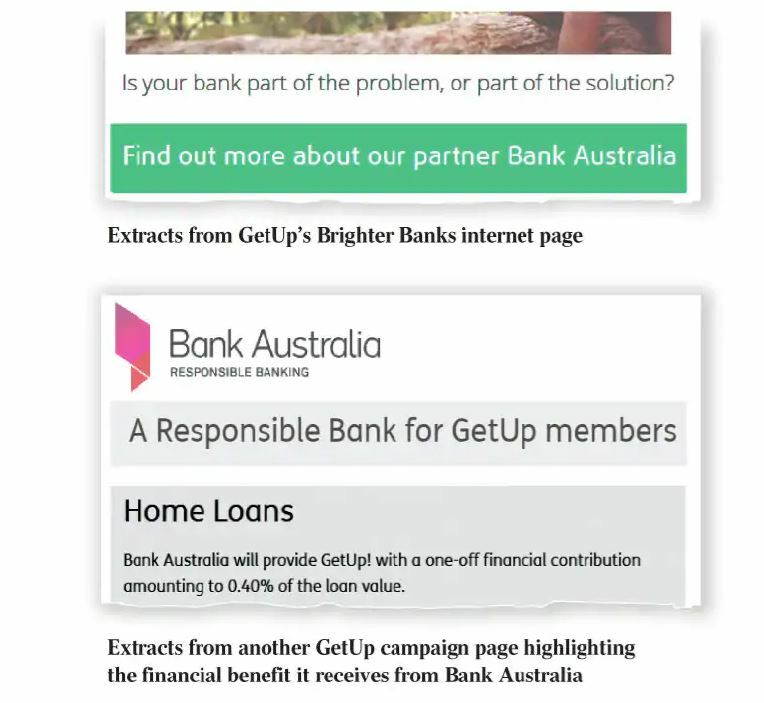 For every person who switches to Bank Australia through the Brighter Banks campaign, GetUp receives a once-off financial contribution — allowing us to do even more to fight for a safe climate future,” GetUp says on its Brighter Banks website. Details of the commission payments to GetUp are disclosed on the page that people interested in the deal click through to. Bank Australia said yesterday the arrangement with GetUp was one of about 30 it had with not-for-profit community organisations that were “aligned to our values”. The bank professes to deal in “clean” money and has been advertising to lift its profile on the back of the Hayne inquiry. “Customers who join Bank Australia through these partnerships know their choice to switch banks is also benefiting organisations they support and care about,” it said in a statement to The Australian. Headquartered in Melbourne, Bank Australia is a financial mutual that dates back to the CSIRO Co-operative Credit Society in the 1950s, with 130,000 customers and assets totalling $5.6 billion as of 2018. It trumpets its money as being “clean” because it is “never loaned to industries … that do harm”, named as coal, nuclear weapons, gambling, tobacco and live animal exports. Yet the bank’s board draws heavily on the expertise of mining and finance industry insiders. It is chaired by former Alumina Ltd executive and Alcoa ­director Judith Downes, who sits alongside ANZ’s former New Zealand boss Greg Camm, former industry superannuation fund HESTA chief executive Anne-Marie Corboy, former KPMG auditor Michelle Somerville and former Virgin Money Australia chief executive David Wakeley. 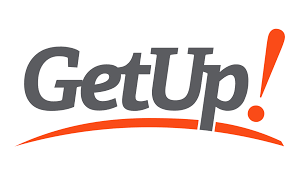 GetUp said its earnings from corporate referrals, which fell from $354,770 in 2017 to $97,420 last year, also covered its deal with Powershop and solar-battery switching offers. The Australian detailed in 2017 how GetUp had been accused of “perpetuating a myth” that ­Powershop’s electricity was green, when it came from the mix of ­renewable and traditional coal-based energy. next post: GetUp – Purveyors of Hate and Division?